Small on size, big on features! The Alpli 400 SYN demonstrates what kids’ sleeping bags need to be capable of. The Alpli 400 SYN can be adjusted from 105 to 135 centimeters so it grows along with your child. Adjusting the length is child’s play, as is the kid-friendly main zip which can be used from inside or outside the bag; a useful feature for parents who want to tuck their kids into bed. An integrated pillow and a small outer compartment for your child’s favourite stuffed animal help guarantee and cozy, comfortable night’s sleep. 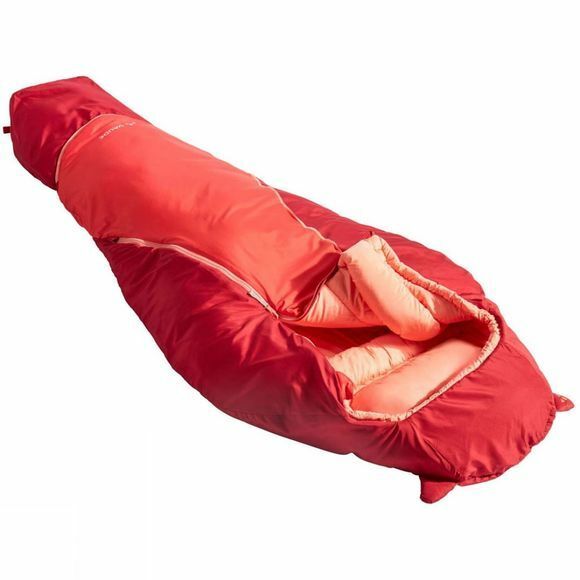 The synthetic fill provides cozy warmth even on cool nights so your next family camping holiday is sure to be a success. The VAUDE Green Shape label stands for environmentally-friendly, functional products made from sustainable materials.